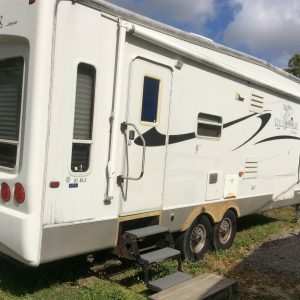 I recently purchased this 2004 31 foot Jayco Designer. I will have a new roof put on it next week. My question is regarding the weathered sides. I noticed chalking on my fingers when I rub the paint. What product/products do you recommend to help slow down/restore the Florida sun damage? I hear people mention the phrase gel coat too. Is that an option? There is some good life left in this unit and the price was right (5k) or least I feel it was right. Thank you in advance for your help. Sounds like you got a good deal! Gel coating is not an option on this unit. The only long term solution to stop the chalking is to have the unit body painted, but that is very expensive. To bring back the life of the exterior of your Jayco fifth wheel I would first give her a good strong Beast Washing. This will help remove some of the chalking. Then, buff all the white areas out with our RV Finish Restorer kit. This will remove the rest of the chalk and bring back any shine that may be left in your finish. Your will need to wax her every three months after that to keep the finish looking good. Don’t wash her with soaps in-between the waxings because this will only shorten the life of the wax on the finish. The next order of business will be to paint your plastic step molding along with the plastic over the tires. I would simply go with Semi Flat black spray paint, you will never get paint to match the gold. If you are handy with a can of spray paint you could paint everything a hammered gold finish spray paint below your trim molding to give that factory look. And then finish up with your side walls. The Designer series had a better finish than the entry level Jayco units so I think with a little work you can probably give her a pretty good looking shine. Stay away from your vinyl graphics with the machine. In fact I would recommend using painters tape to mask off the edges before you use the machine around them. Use the blue easy to remove type of tape. Your graphics don’t look that bad, you can’t do anything make them look better, but you can easily damage any color left in them if not careful. Thank you so much for the advice. I have printed out your reply and will place my order for the products you mentioned. The new roof will go on this week as they rains in FL will be starting soon. Then time for some elbow grease. I sure appreciate you providing this opportunity to ask questions. Looking forward to doing business with you.